In OSB you can protect your WSDL proxy services with XML Signature / encryption, authentication or your own custom ws-policy. In this blog entry I will give you all the information how to do this. Add the Signing policy to a operation or put this in a other part of the WSDL see this url for more information. In this case I can use wsp:Policy with a PolicyReference and the URI is policy:Sign.xml . If you want encryption then you can use policy:Encrypt.xml as URI or use policy:Auth.xml for ws authentication. Off course you can combine policies. You don't have to use the OSB standard policies, you can also add your own ws-policy ( in OSB 10.3 you can only use the policy definition of WLS 9, so don't expect you can make policies which uses the 2005 or 2007 WS-Security standard). Here is a example of a custom policy. 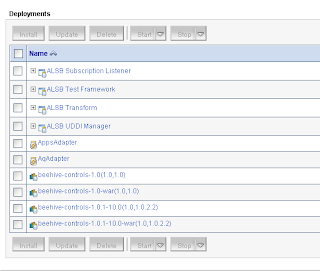 The next step is to make some keystores for WebLogic and OSB. We need to create 509 v3 certificates and import these certificates in a java 1.6 keystore for signing and encryption. We need to have 509 version 3 certificates because we need the SubjectKeyIdentifier extension. This is only supported in version 3 of 509 and only OpenSSL can generate these certificates. You can use self signed v3 certificates, for more info see this Glen Mazza's weblog. I'll use a CA. 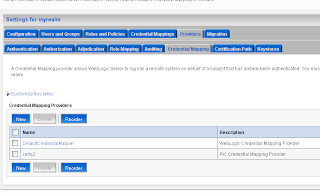 The next step is to configure Weblogic. 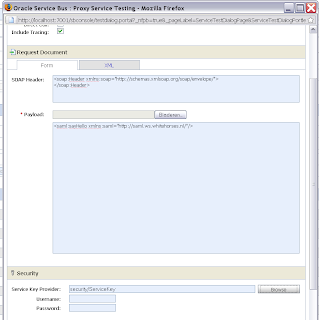 First we add the new keystores and configure SSL and add a new PKI Credential mapping provider. The PKI Credential mapping provider will be used by OSB for the XMLsignature and encryption. The trust keystore will be used to check if the signer certificate is trusted. In the SSL tab we will use the server certificate which has the server + domain name as Common name so Internet explorer won't complain that the certificate and server name does not match. 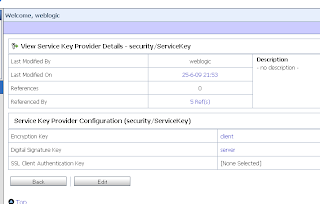 We are finished in the Weblogic Console and we can go the OSB console where we have to create a new Service Key provider and configure the Proxy service so it uses this provider. Create a new Service Key provider. 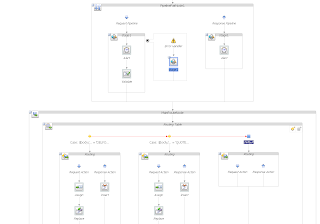 This how it looks like in the Workshop but this does not work because eclipse can't retrieve the certificates of the PKI credential mapping provider. 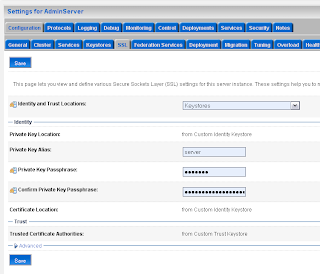 So we have to use the OSB console to add the right certificate for signing and encryption to the Service Key Provider. Now we see the certificates of the Weblogic PKI Credential mapping. If you don't see this then probably you don't use 509 version 3 certifcates. Now we can test the proxy service by invoking the WS and selecting the Service Key Provider. If you want to use OSB 10.3 security with Soa Suite 11g R1 then you should read this 11g documentation, This explains how to change the OSB encrypt and sign policy so it works with FMW 11g. With the release of OSB 1.3.1 with JCA adapter support I can finally compare the OSB with the ESB. I will run this performance test on my Dell laptop ( Core2Duo T9400 2.53 GHz with 3,5 Gb memory ) and try to use the same components in the OSB and the ESB. For example I will use a memory JMS Queue in the Oracle Application server as starting point for the ESB and a file based JMS Queue in WLS as starting point for the OSB process. Both OSB and ESB processes has to fill the same four tables in the Oracle 11G database and they will use the same Toplink database mappings. 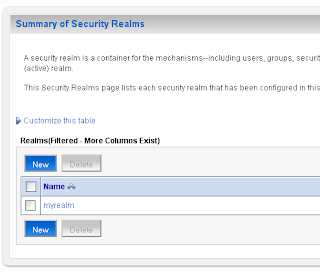 For the test I will disable the JMS adapter in the ESB console or stop the queue consumption in the WLS console. Then fill the Queues and start the Service Bus processes . Before the test I will do some test runs so I know everything is alright and the Service Bus is warmed up. Here is a picture of the ESB process. This process reads the Queue and pass it asynchronous to the next Router. 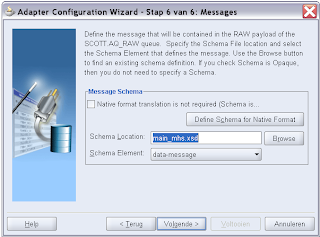 This message with a XML anytype element is transformed with XSLT to a specific message schema and the last Router transforms it to the database adapter XSD. The OSB process works almost the same as the ESB process but in the OSB I will use XQuery instead of XLST and use Proxy Services as Routers and a Business service as Database Adapter. 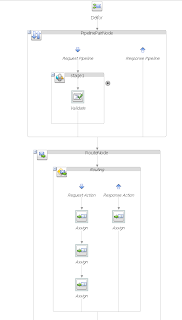 Here you see a process schema of Messaging proxy service. It start with a PipelinePair to do some XSD validation on the incoming message. Then the Proxy Service determines the message type in in the RouteNode, do the first XQuery transformation to make the specific message XML and start the next specific Message Proxy Service. The specific message Proxy Service validates the XML and in the RouteNode ( Mapped to the JCA database adapter Business Service ) the next XQuery takes place, so the Business Service get the right XML for the Toplink database mapping. The OSB is the overall winner with 15% a 90% better performance than the ESB. Off course this is not the best testcase and there are other areas of the Service Bus where you can do tests for, but with this case the OSB is much faster especially with big messages ( even with JRockit ) . 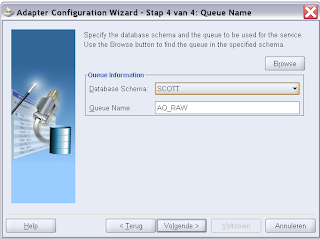 This OSB process does even more then the ESB process, the OSB process returns a message with the result of the database adapter and put this message in a WLS Queue. Don't know why OSB has a better performance, maybe Weblogic is faster or the ESB instance logging is the problem. In the next Soa Suite patchset 10.1.3.5, I can test the ESB processes on WebLogic server and compare this with these results. 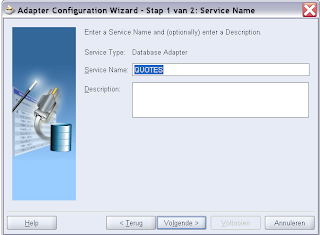 In my previous blogpost I already showed you how to use a JCA Database adapter in a Business Service. 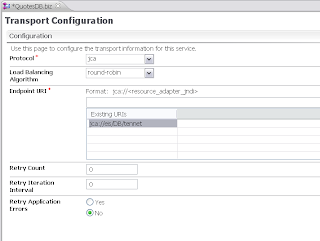 In this blog I will use the AQ resource adapter in a OSB 10.3.1 Proxy Service. To make this work I use the Oracle Workshop for the OSB configuration and JDeveloper 10.1.3.4 for AQ adapter configuration. I heard from Oracle that in one of the next 11g releases you can do this all in JDeveloper. We start in the WLS console of the OSB Server. 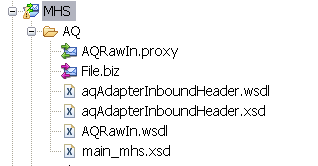 Go to the deployments and find the AqAdapter resource adapter. 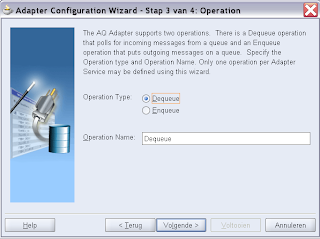 Open the AqAdapter and select the configuration Tab where we will create a new outbound connection pool. Provide the JNDI name, I'll use the JDeveloper name convention. eis/AQ/xxxx , xxxx is the database connection name in JDeveloper. Give the resource adapter plan a unique name and save this AQ plan. Select the just created JDNI configuration. We have provide the xADatasourceName. 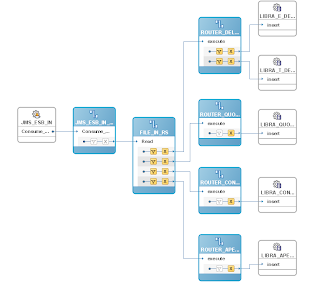 This is a datasource of WLS which connects to a Oracle schema user which has access to the AQ queues. Or you can provide the jdbc url , username and password. We are finished with the Weblogic configuration and we can switch to JDeveloper 10.1.3.4 where we will make the AQ configuration files which we have to import in our OSB project. 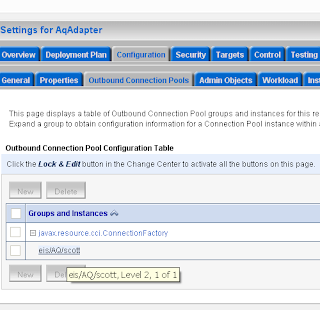 Make a new ESB project where we will add the AQ adapter to the ESB configuration. 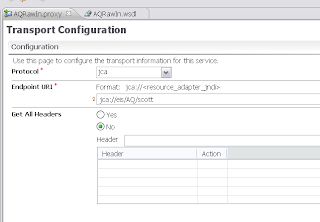 The JNDI name in the AQ adapter wizard must match with the JNDI eis name of the AQ resource adapter in the WLS console. This OSB proxy service read from the queue so we need to dequeue. And select a XSD which matches with the AQ messages. Delete the router service we don't need this. The last part is to use this AQ queue in a OSB proxy service, Start the Oracle workshop and import AQ wsdl's and schema's into your OSB project. 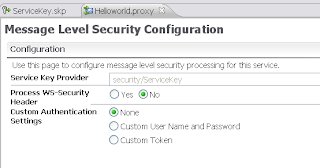 Create a new Proxy service and use the AQ WSDL. OSB will detect the JCA adapter configuration. That's all for the AQ configuration. With the OSB 10.3.1 release we can use the JCA Database adapter in our processes. In this blog I will show you, what steps are needed to make this work. 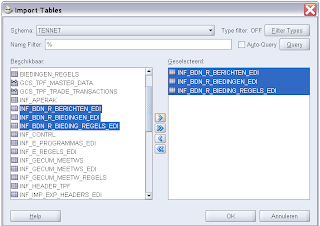 First we need to create a XA thin JDBC datasource in the WLS console of the OSB Server. 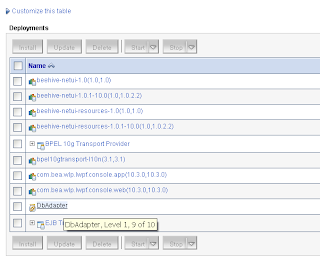 Next step is to configure the DB resource adapter. 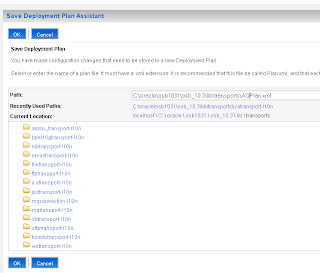 Go to deployments in the WLS Console of the OSB Server, where we select the DbAdapter deployment. 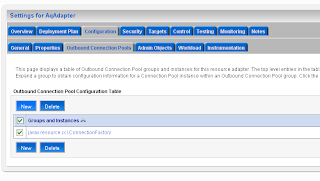 Go to Outbound Connection Pools Tab under Configuration and select the already created connectionfactory and press New. Switch to JDeveloper 10.1.3.4 where we will create a new ESB project. ( I will create a new ESB Project for every DB adapter, This will make deployment a little bit easier). 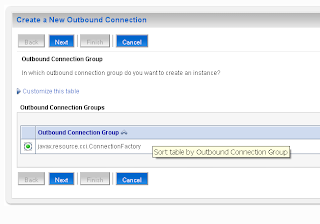 Add a new DB adapter in the ESB overview. We need this WSDL in the OSB, This WSDL contains the EIS JNDI name and the wanted operation. 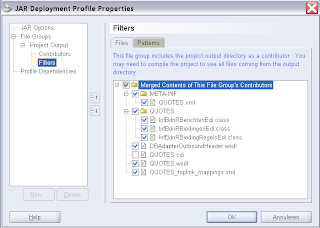 We need the toplink classes in the OSB server so we need to make a jar deployment profile. Start the Oracle Workshop where we make a new folder (with the name of the DB adapter service) in your project. Import the jar and the WSDL's / XSD of the JDeveloper ESB project. 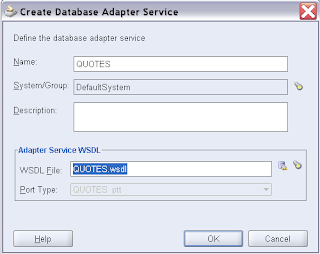 Create a new Business Service and use the WSDL of your DB adapter service. 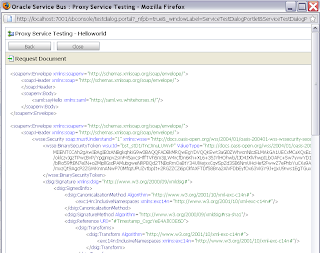 Last step is to test the Business Service with a valid xml. check for errors in the WLS Console output window. Oracle has released OSB 10.3.1, This version has a JCA transport support, so now you can use the Oracle Apps, Advanced Queuing (AQ) or the Database adapters in OSB, just like you can in the Soa Suite. 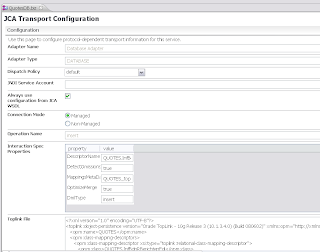 It also support WSLT import & export of OSB configurations, possible very handy for automatically publishing. 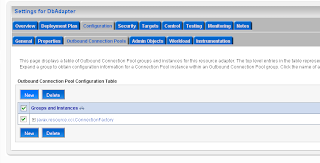 And the latest Enterprise Grid Control release can monitor your Weblogic server and OSB service. Here some handy information about the OSB 10.3.1 release. My solution is a bit different, I made a custom XSLT function which can add WS-Security credentials and add a Timestamp to the SOAP Header. 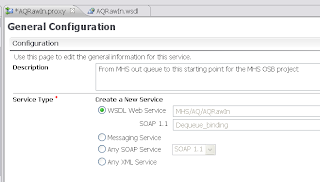 You only have to provide the username, password , digest ( or plaintext ) and the time ( in ms ) this SOAP message is valid. 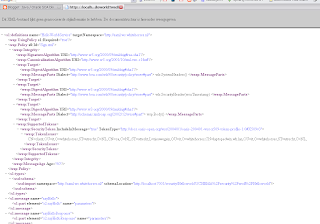 This is how my XSLT looks like. And with this as result. This is my java source for the xslt function. And custom extension definitions for JDeveloper with the new XSLT function. If you follow this great guide of Pavan. 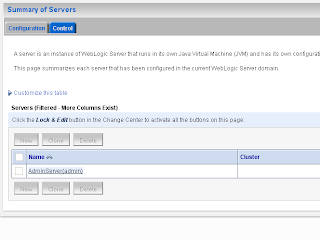 you can use the JMS Queues / Topics of Weblogic 9.2 in In Soa Suite 10.1.3.3 / 10.1.3.4. But I don't want to do a step back and want to use the Weblogic 10.3 version. With the help of Oracle Support it works now with version 10.3. The only thing I had to change ( if you follow the Pavan Guide ) is to remove the weblogic jar from the jms adapter folder in the Soa Suite J2EE container. Generate a jdk5 wsfullclient jar and put this in a folder where Soa Suite does not automatically loads this jar. 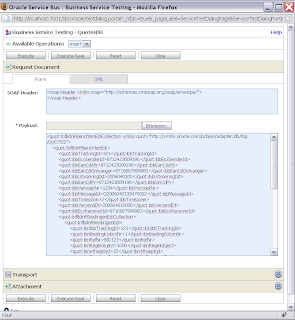 Change the server.xml of the Soa Suite Container where we will add this jar to oracle.bpel.common shared library. Make sure the fullclient reference is before orabpel-thirdparty.jar reference, because this thirdparty also contains wls classes. Or you can wait for the 10.1.3.4 MLR8 patch. 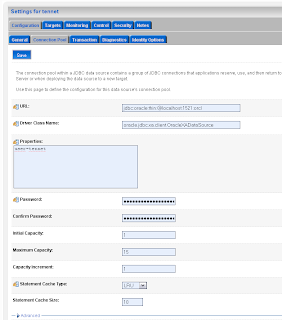 Now we can use the WLS 10.3 JMS adapters in Oracle BPEL and ESB.